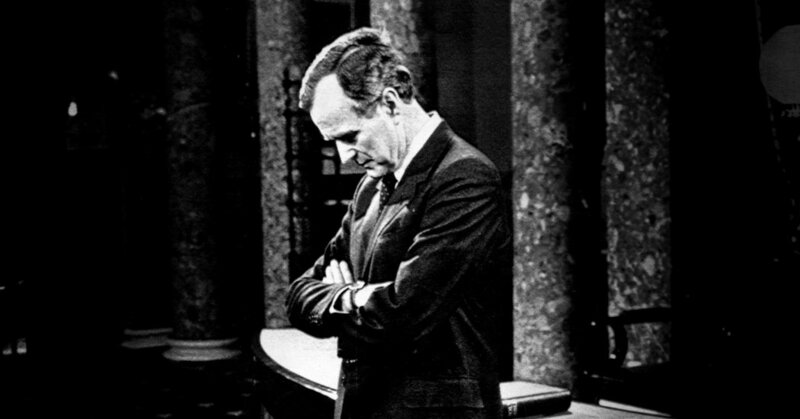 The death of George H.W. 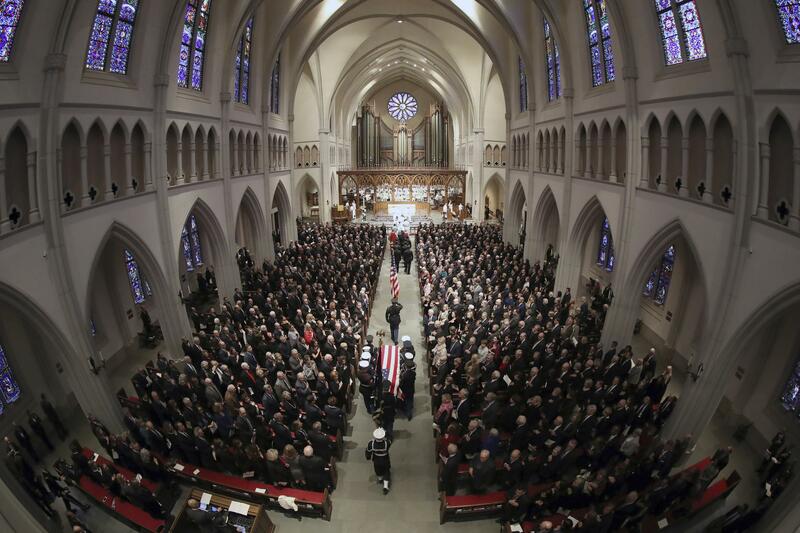 Bush brought us a week’s worth of ceremony, eulogy and wall-to-wall coverage. This week, a look at the choices journalists made when they set out to memorialize the president. And, immigration stories in our media focus on the U.S.–Mexico border — but what about immigration elsewhere in Latin America? Is there a journalistic solution to the scale of global immigration? Plus, a baseball metaphor and a bit of forgotten Hanukkah history. 1. Anne Helen Petersen [@annehelen], senior culture writer at Buzzfeed, and David Greenberg [@republicofspin], historian at Rutgers University, on the history — and pitfalls — of presidential eulogies. Listen. 2. Bob on the speculation surrounding Robert Mueller's investigation. Listen. 3. Diego Salazar [@disalch], journalist, on the immigration crisis within Latin America. Listen. 4. Masha Gessen [@mashagessen], staff writer at The New Yorker, on her modest proposal for immigration coverage. Listen. 5. Rabbi James Ponet, Jewish chaplain emeritus at Yale University, on the historical origins of Hanukkah. Listen. The ideas of rosier pictures of past presidents is an interesting one. Masha Gessen’s story makes me wish we had many more Masha Gessens. I particularly liked the story and history of Hanukkah given here. Definitely something to think about. The 41st president took the helm during a moment of seismic change on the international stage and in the political order at home. Where have all the good public servants gone? Interesting that he dies on the same day that Trump declares victory over the death of NAFTA. Is he really a “billionaire”?! I thought the Times’ own reporting had refuted this pretty soundly? Madam President, thank you for that wonderful, warm introduction and what a pleasure it was to meet with Asma and the other leaders of this class here today. I felt very relieved when I told them that I was going to give this speech on the gold standard and the international balance of payments. It only takes about 50 minutes and they all seemed enthralled with the idea. All of which reminded me, as I was telling Dr. Nathans and my friend, Mike Bloomberg, who's taken on the chairmanship of the board here, about a graduation at Yale University which I attended, and the speaker went on. He went Y is for Youth, he went on about 25 minutes, A for Altruism, another 35 minutes, L for Loyalty, 30 minutes, E for Excellence. By the time he finished, all but one kid had left. The guy was praying. He said, "Oh son, I'm so pleased to see you here giving thanks." He said, "What exactly are you praying for?" The kid said, "Well, I'm praying that I did not ... thanks to the Lord that I did not go to Johns Hopkins University." Um, I'm pleased to be here. It's been a little more that six years since I visited this prestigious university for Commemoration Day. And I am delighted to be back here. I salute Dr. Nathans for what he has given to this university, not only as faculty but as his interim period as president and I am grateful for his service to the country on our Science Board which he served ... with no partiality, but just bringing to the board his sense of excellence for which Johns Hopkins is so famous. It doesn't seem possible that 48 years ago I was sitting out there where our graduates are today, most of them, bursting to get out there and claim my stake in the world, to try anything. And I am sure that each of you feels the same way, and I encourage you to do it all. Don't be afraid of trying, of dreaming. Don't even be afraid of failure or tears. We all stumble. We all face fear, and that's what makes us human. But none of us should ever regret, none of us should ever sit at a grandchild's graduation and think, I wish that that were me, starting all over again, there's so much I'd do differently. First of all, don't worry, any of you graduates, if you're not 100 percent sure what you want to do the rest of your life, what you want to be 30 years from now. Barbara and I have lived in about 40 different houses, over the course of 51 years of marriage, and I wish Barbara would stop saying, "George can't hold a job." But, uh, but it was only after a couple of decades out in the real world that I knew what I wanted to do with the rest of my life. But the point is this, you have a lifetime of chances in your grasp right now. Don't lose any of them. Don't give up the chance to take a risk, follow a vision, hug a child, touch a life. Touching a life. That's what I want to talk to you about today. Each of you has visions of success for your future. You can just feel the energy as the president spoke here, what a wonderful job she did. Find your own ways to define it. Let me give you mine. As often I said as president, I believe that any definition of a successful life must include service to others. It's just that simple. It doesn't mean that you have to run for public office, but I hope all of you will somehow save some time to be actively involved in our political system. It's not very pleasant in the political arena these days. There's an adversarial press, and a very, very much, kind of a controversial environment. But it's worth it. It's worth it to get into what Teddy Roosevelt calls the arena, roll up your sleeves and try. Serving others does mean rolling up your sleeves and getting involved in your community, though. It means getting off the sidelines, it means being a doer and not a critic. It means contributing to a cause larger than yourself. There is no problem. You know you read the papers, there's all these problems. But there is not one single problem in the country today that somewhere is not being solved by some people. And for eight years as vice president and four as president and even today unemployed and retired, I have seen literally thousands of examples of the neighbor-helping-neighbor spirit that made this country the kindest and the gentlest and the strongest in the entire world. It was one of the real joys of being president, and Barbara and I are continuing to try and encourage others to volunteer their time and effort to fighting a community problem. People say, "What's it like from going from being president of the United States of America one day" ... they don't say to be unemployed the next, they're very polite to us now. We can even go to a ballgame in Camden Yards and not even get booed. It's wonderful. But they say, "What's it like," "What's it like?" and it's a wonderful life, because what we want to do is what everybody on this faculty, I'm sure, does; what every parent does; and that's put something back into the system. Give something to the community in one way or another. It doesn't have to be dramatic, it doesn't have to be in the newspapers, some way to have the satisfaction of knowing you're helping make somebody else's life a little brighter. Of course, government has an obligation to help those who cannot help themselves. And yet there's something special about the kindness of a neighbor helping someone he or she doesn't know. It gives that special touch that is beyond the power of government to provide. No exercise is better for the human heart than reaching down and lifting someone else up, and to serve others, to enrich your community. This truly defines a successful life. For success is personal, and it is charitable, and it is the sum, not of our possessions, but of how we help others. And so, here I am at 72 years old, and I'm expected to give advice, and I will. My advice is to encourage you to follow the example of those who have preceded you and to set an example for those who follow. For each of you, Johns Hopkins has been a wonderful place of possibilities. This standard of excellence has been for each of you a place of possibilities. A place where you have developed your potential and prepared for the future. But now the time has come to venture out. The time has arrived for you to put in the hard work and the sacrifice and dedication that transforms these possibilities into reality. Do it all, but do it without neglect of family. People say to me, "What's the largest problem, what's your biggest shortcoming?" The largest problem is, in my view, facing the country is the decline or the weakening of the American family and my biggest shortcoming was not being able to rally the country, not for government legislation, but to do something to strengthen the American family. And so each of you, your career paths ahead of you, do something to help strengthen the family and for those kids that don't have a family, take them under your wing and help them, too. Let me close. I am an optimist about the future. I honestly and truly believe that our best days are yet to come. I believe this because I've seen how far we've come. Gone are the suspicions and the conflict of the Cold War. We no longer face threat of nuclear holocaust, where your parents, some of them, were taught to hide under their desks, to avoid nuclear fallout. We no longer live in a world of two antagonistic superpowers, and, as for me, I take heart that a teacher will not have to explain balance of terror, mutually assured destruction, and all of these other acronyms of the Cold War. We're putting that dark chapter behind us and today the world is rife with promise and opportunity, and yes, cliche though it may be, today begins the rest of your life. A Yale teacher once said, "Whatever you can do or dream you can do, begin it, for today has power, boldness and magic in it. My favorite story was told by a great friend of Barbara's and mine who received the congressional gold medal the other day, the coveted award, Billy Graham. And he told about a speaker that was standing where I am and the speaker went on too long, so one of the guys at the head table, the dais, picked up his shoe, heaved it at him, missed him and hit a lady sitting in the front row. She goes like this and says, "Hit me again. I can still hear him." So I would say to you, be bold in your dreaming, be bold in your living, be bold in your caring, your compassion, your humanity and then, when you sit at your grandchild's commencement half a century from now, you'll look back at the tapestry of your life and find it good, and that will be the greatest success of all. Thank you for welcoming me back to this very special campus and may God bless every single graduate in the class of 1996. Thank you very much!